Bows & Crows: Collar to Cuff Project: More Bag Development and Finished Bag! Collar to Cuff Project: More Bag Development and Finished Bag! Here are some photos of my marketing bag, finally completed! 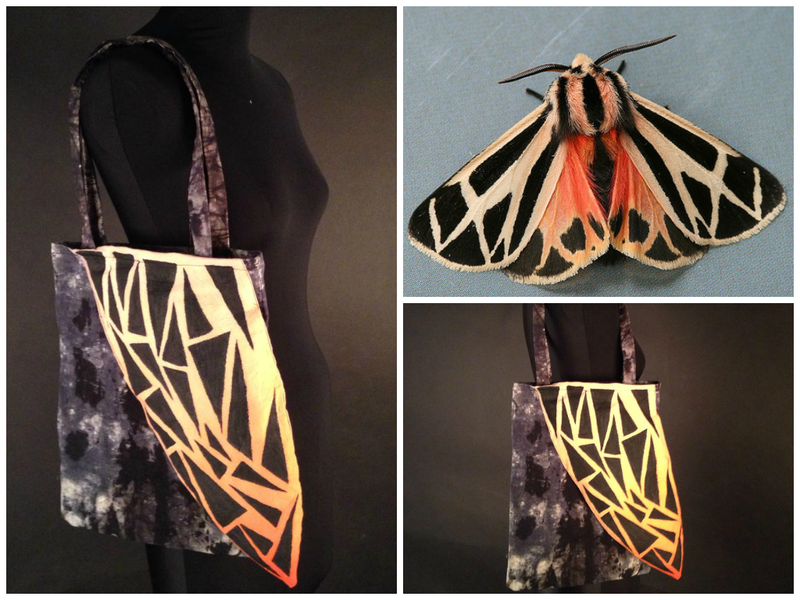 My bag is based solely around one image I found of a moth, I chose this image as I found the colours and patterns of the moth really fun, and I thought there was a lot I could play around with. I'm so so pleased with the final result! Creating my bag was definitely the part of this project I enjoyed the most, not just because I like the outcome, but because I had so much fun dyeing the fabrics and painting the pattern! Speaking of the pattern on my bag- I did have a bit of trouble with that at first. Originally I planned to applique the triangles on, but I'm really glad I went for using fabric paints as I think it looks a lot neater. Also, to help my bag link in with my shirt design even more, I decided to wad the wing element of my bag too, just like the wing elements on my shirt are wadded. I think this adds a really nice connected vibe between my bag and shirt. I really hope in future projects we get to do something similar to this, as I really loved the entire process!